This new Macro Twin Lite MT-24EX is the most flexible and versatile macro flash unit available in any SLR system. The flash system offers full E-TTL metering and supports TTL auto flash plus manual flash exposure control on all Canon EOS System cameras, including the new Canon EOS-1D digital SLR. The flexibility resides in its dual flash heads and the ability to rotate the heads, both vertically and horizontally, and remove them from the mounting ring for handheld use or for placement on a tripod. The flash heads can be fired together or individually, providing even greater lighting flexibility. In addition, the mounting ring itself can be rotated. Supplying a powerful maximum Guide Number of 78 (ISO 100/ft. ), the new Macro Twin Lite supports a number of advanced flash metering and customization features, including Flash Exposure Lock, FP Flash (high-speed sync), variable power manual flash, wireless remote functions, and 9 Custom Functions. The unit’s flash heads are connected to the mounting ring, which in turn is attached directly to the front of 3 EF macro lenses including the EF 50mm f/2.5 Compact Macro, EF 100mm f/2.8 Macro USM, or MP-E 65mm f/2.8 1x-5x Macrophoto lens. Additionally, the Macro Twin Lite MT-24EX can be attached to the EF 180mm f/3.5L Macro USM lens using Macrolite Adapter 72C (sold separately). With E-TTL compatible EOS cameras, photographers can utilize other functions beyond conventional flash photography, including Flash Exposure Lock and FP Flash. The Flash Exposure Lock (FEL) feature (a form of spot metering for flash) allows users to take and memorize a light reading from any given spot in the picture area, using the camera’s spot or partial metering modes. This virtually guarantees that the most critical area of a scene will be perfectly exposed, even if it is placed off-center for better composition. In addition, the Macro Twin Lite MT-24EX can be automatically synchronized to the camera’s maximum shutter speed using the FP flash (high-speed sync) feature. Photographers can now use higher shutter speeds and wider apertures outdoors in any lighting condition to achieve greater creative control. 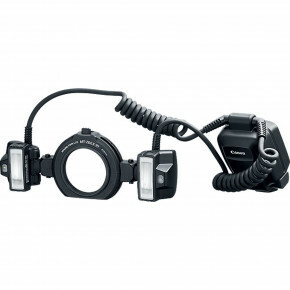 The new Macro Twin Lite features two flash tubes that can be used together or independently. When both flashes are fired in E-TTL and used together with the EOS-1v, EOS-3, EOS D30 or EOS-1D, lighting ratios can be set in ½ stop increments up to +/- 3 stops. This provides photographers with extensive creative control even in the most difficult lighting conditions, while offering tremendous exposure latitude for a wide range of subject matter. Lighting ratios can also be controlled between the left and right tubes, even when the flash is placed in its manual mode, and users can select variable power settings over a 7-stop range down to 1/64th power. 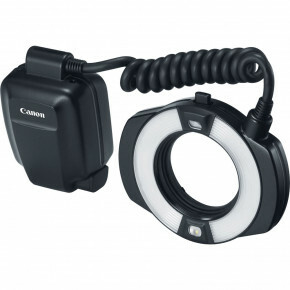 The Macro Twin Lite is compatible with Canon’s exclusive E-TTL wireless auto flash system. Using this advanced technology, photographers can now set up unlimited numbers of 550EX or 420EX Speedlite flash units around the subject. The strategically placed off-camera Speedlites are fired in sync with the Macro Twin Lite with no need for connecting cords. In addition, photographers can adjust and maintain full control of lighting ratios via the LCD panel on the control unit, providing even greater lighting precision. The new MT-24EX is also equipped with twin focusing lamps and a set of 9 Custom Functions that allow the user to modify flash operation for specific shooting conditions. Supported features include Flash Exposure Bracketing, Modeling Flash, and Wireless Flash control. Macro Twin Lite MT-24EX uses 4 AA-size alkaline, lithium, Ni-Cd or Ni-MH batteries and is compatible with Canon's auxiliary power packs, Compact Battery Pack CP-E2 and Transistor Pack E for faster recycling and a greater number of flashes per charge for extended shooting sessions.